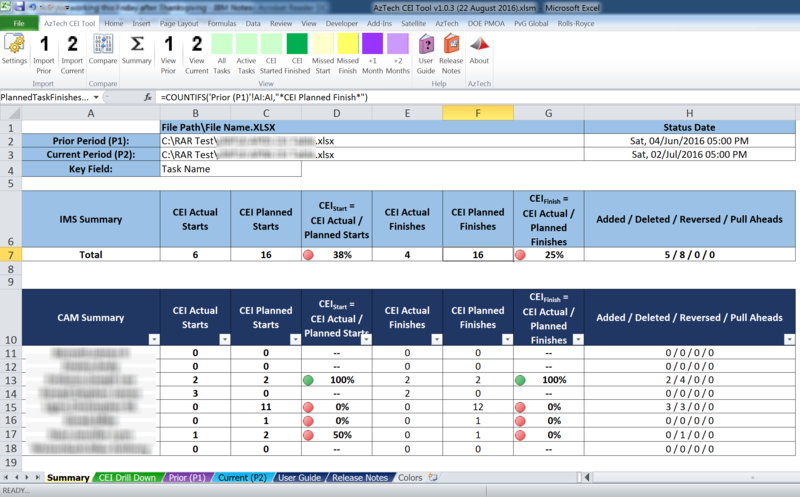 The AzTech Current Execution Index (CEI) Tool compares two periods of schedule data to determine how effectively the team is estimating (forecasting) and completing (executing) tasks. This metric looks only at tasks planned (forecasted) to finish in the prior period and whether or not they were, indeed, finished. The tool compares any two files and generates a total project level CEI and a Control Account Manager (CAM) level CEI. The value of CEI is that it helps assess how several key measures: 1) the validity of the very near-term forecast; 2) the execution rate against that forecast. When CEI is low, it indicates one or a combination of issues with work scope / task definition, completion / exit criteria, forecasting realism, programmatic volatility due to priority management, staff or other resource management, task management, and overall schedule management. How does the AzTech CEI Tool align with your objectives? First time working with the AzTech CEI Tool? We have created an integrated User Guide to help you walk through the process of using the CEI tool. This documentation is located directly inside of the tool and includes startup, exporting data from Run!AzTech, data preparation, importing data into CEI, comparing data, and the various views within the CEI tool. You may always contact our AzTech Tool Suite Hotline to request help. Also, if you consistently use a feature and want us to incorporate new functionality into our next build, we want to hear from you! Contact our WishList Hotline, and maybe your idea will be our next cool feature!